many writers have tried to convey the essence, appeal and worth of orchids. But most have been unsuccessful in their endeavour. Three years ago, I went to the Kew Orchids Festival in London to find out more about them. I have known orchid enthusiasts in the past and have wondered whether there was any medical treatment for their addiction. The Kew festival drew thousands of them - gardeners and botanists - from all over the world wandering with glazed, if not rapt, expressions through a stunning display. Drugged with the wonderment at what is surely the world's most-evolved plant family, they have been collecting growing and researching orchids at Kew for the last 250 years. A collection of 5,000 species from all over the world are growing at any one time and represents 20 per cent of the world total. The Kew festival But Kew is not there just to give a thrill of plant pleasure to horticulturists and their customers, nor is it just a world centre for displaying scientific excellence in the cultivation of orchids. Its role is constantly evolving and Kew now has a "mission statement" which recognises the regrettable imperatives of the present threat to the environment. "The mission of the Royal Botanic Gardens, Kew, is to ensure better management of the Earth's environment by increasing knowledge and understanding of the plant kingdom - the basis of life on Earth." That is no small ambition but Kew has more practical objectives in declaring that it will endeavour to reduce and reverse the rate of destruction of the world's plant species and their habitats. The means of doing this is research, publication, open access to all information and the display and interpretation to the public. The consequences of such a mission statement have a logic of their own which has led to examples of practical sustainable development work as will be seen. But first the irresistibility of orchids must be addressed; why do people find them so attractive? Orchids go far beyond just luring by their attractiveness. They give off fragrance, usually very agreeable to humans like many other flowers, but which in their case, can sometimes vary at different times of the day. For instance, the Moth Orchid gives off lily-of-the-valley in the morning and rose fragrance by night. The fragrance are targeted at specific insects and at least fifty aromatic compounds are blended in a range from the smell of mothballs to the stink of rotting meat. The perianth or the structure (calyx and corolla) that protects the developing reproductive parts of the plant is divided into an inner and outer whorl, each usually in three parts, and it is the inner whorl that evolves the exotic shapes which distinguish the orchid. The middle petal of this whorl has become, for example, the slipper of the Lady's Slipper orchid, or a 30 cm spur with nectar at the bottom, or a sort of pail with a scented fluid which makes the questing Humble-bee inebriated as in the Central American Bucket Orchid. Other orchids disguise themselves as female insects, like the Bee Orchid, and some of them, in which the trickery is made more real by giving off an odour akin to female insects provoking males into attempting copulation. All of this is devoted to getting pollen stuck to the insects so that it may be carried to the stigma of another orchid. The pollen is usually massed on robust devices called pollinia which are sticky and large. The varied shapes into which petals have been formed by evolutionary adaptation include catapults, buckets, slides, trap doors, trumpets, spurs, springs, trip wires, landing platforms, mirrors and windows. What's unique about orchids? A few facts should be quickly logged just for the record. The most spectacular orchids are tropical and mostly grow on trees as epiphytes though some grow on mossy stones. The flowers can last for as long as three months if not fertilised. The temperate ones are usually found growing on the ground and are of more modest stature but equally complex and beautiful. They often have a symbiotic relationship with a fungus which means they do not like being dug up for the garden. It is now known that this symbiosis is not quite so complex a relationship as previously considered and that, with the right skills, orchids can be transplanted. 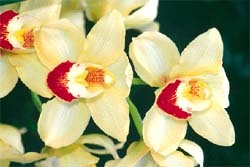 The first tropical orchid was brought to Europe by the Spaniards in 1510. It was the Vanilla and this still provides the only plant product to come from the whole family - the essence used in so many desserts and ice creams till today. However, it has to be said that most of the visitors to Kew were not there to admire the evolutionary virtuosity of the Orchidaceae but rather the outcome of something discovered as late as in 1853 by a John Dominey, a plantsperson from London. He discovered that orchids hybridise quite readily and show what is known as hybrid vigour. At the door of the Princess of Wales Conservatory during Kew's orchid festival was a stunning specimen of the art of hybridisation. The top flower of a 2-metre long pendant was bright yellow, complex in form and as big as two dinner plates. Below it were seven more, which were scarcely less large in size, stretching down to the ground. It was flanked by more and more prodigious specimens which drew exclamation of admiration from all and quite a number of the admirers were probably expert growers themselves. The consensus was that at Kew they certainly knew how to grow orchids. Kew also finds itself engaged in the conservation of the orchids of Madagascar as a side effect of an interest in the island's palms. There are 171 unique palms and a rising interest in such an important economic plant led to a comprehensive book "Palms of Madagascar". At the same time, it provoked a sharp awareness of the speed with which the island was being denuded of both its primary vegetation, its spectacular endemic plant resources, such as its orchids and the state of the botanical scientific resources needed for conservation work. But what of the "mission statement" and the "endeavour to reduce and reverse the rate of destruction of the world's plant species and their habitats"? The transition from collecting to conserving has followed its internal logic but, as is typical of the British, there is no great publicised strategic plan with goals and critical paths but more a change in atmosphere and priorities leading to practical activity. And there has also been a large admixture of chance.